Our new SwiftEnterprise 5.2 release is packed with goodies that will help you monitor Agile projects much more easily and effectively through the default dashboard pages with pre-configured widgets. This includes new widgets that help you assess different dimensions of sprint, release, and quality that are crucial for its success. And on the dashboard front, the project level dashboard gets the addition of the Pivot Analytics as a dashboard widget. Keeping track of your Agile projects has become much easier with the introduction of default Sprint, Release & Quality dashboard pages. Each page has pre-configured widgets that represent important dimensions of the Sprint, Release & Quality of on-going and recent Sprints or Releases. While widget settings can be changed as per the project needs, page level changes are restricted to allow free flow of future product updates. NOTE: Depending on your organizational needs, you may turn off these pages until they are ready to be rolled out in existing and future agile projects. This widget helps you get a quick view of the workitem type-wise distribution of the workitems for a given Release or Sprint. 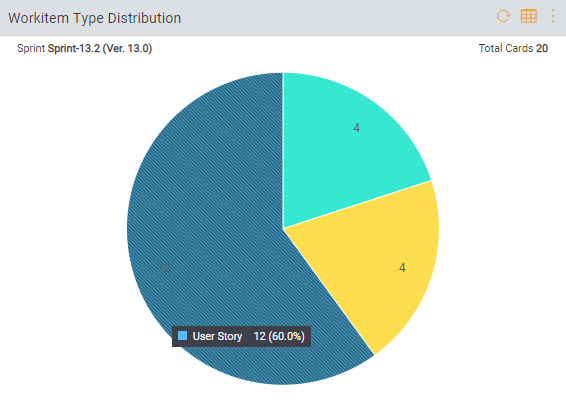 The Pie Chart can be viewed in terms of Workitem Count and Estimate (Points) thus giving you weightage for each work type. This widget helps distinguish the amount of work delivered in the past releases based on the workitem types chosen to be ‘Value Added’ and ‘Non-value Add’ type of work. This widget can be viewed in terms of Workitem Count and Estimate (Points). This helps you towards maintaining the right balance in the future releases. 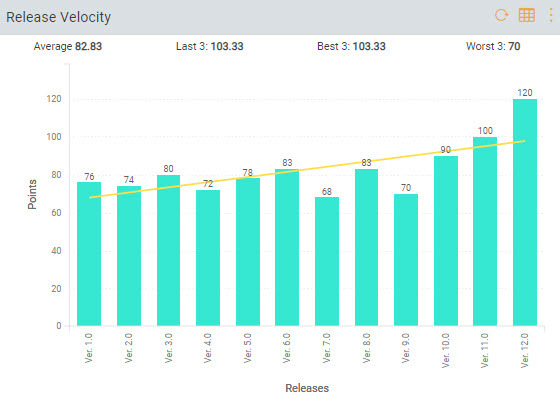 Just like the Sprint Velocity widget, you can now view the Velocity of the workitems delivered across the past Releases in terms of Workitem Count and Estimate (Points). Here too, you get to see the average velocity along with the best 3, worst 3 and last 3 releases as summary on top of the chart. 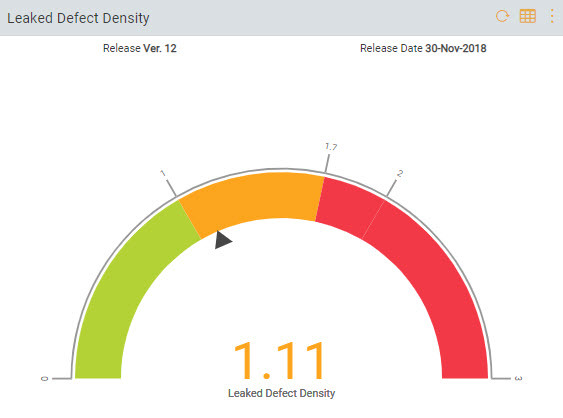 This Dial chart widget helps you quickly gauge the quality of a release by computing the number of Defects reported on the release against the total workitems delivered in that release. You also get the flexibility to chose the “Found in Release” attribute on the Defects based on which the leaked or post-release defects are tracked. 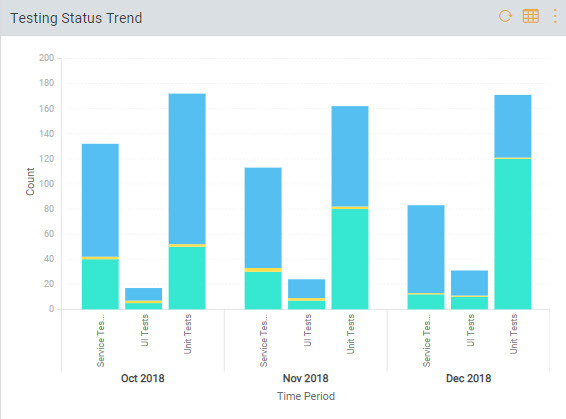 This Clustered Bar chart widget helps you visualize the number of Test Units that have been created across the recent months and also classifies them based on the Test Type and Automation Status. 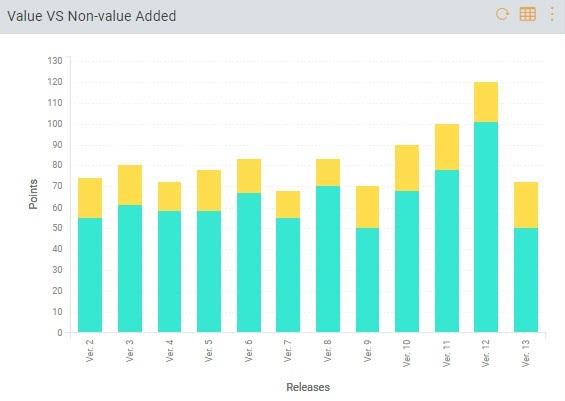 This way, you can keep track of how healthy the growth of your test repository has been and how much of it has been automated, which are crucial factors for improving test coverage and reducing release duration. The ability to build cross-item type pivot tables has been made available in Dashboard itself. You can now plot multiple Pivot tables as different widgets with the same ease and flexibility as it was earlier at the project level. Manage your Digital Transformation and DevOps Projects Effectively! Request for a customized SwiftEnterprise Demo!